Explore our new framework policy that will govern how the Board shapes NAEP assessments. NAEP achievement levels help us put results and performance into context. Read this overview of their important role. Read an Education Week blog on NAEP results showing that some large urban school districts are improving faster than the nation as a whole. Before NAEP results for urban districts are released, check out our overview of the Trial Urban District Assessment. Now that NAEP 2017 results are out, check out the NAEP Reading Framework that formed the foundation of the assessment. Check out individual videos, webcast and presentations from our international assessment panel. The Governing Board unanimously elected Tonya Matthews as Vice Chair for a one-year term beginning October 1. Explore background on The Nation's Report Card, and watch a video that introduces NAEP and its importance. Download materials for our quarterly Board meeting in Montgomery, Alabama. Watch Board member Carol Jago discuss how we can improve reading achievement in light of flat NAEP scores. Black girls rock in STEM! Check out these “Hidden Figures” from NAEP. Watch our new video featuring Governing Board members describe their role and impact in overseeing NAEP. Check out our new one-pager on NAEP's move to a digital platform. Find out more about us! Watch a video where members discuss their roles on the Board and their relation to NAEP. A special study linked NAEP and Trends in International Mathematics and Science Study (TIMSS). Explore the results and resources. Watch a video on how NAEP provides valuable insight on performance in technology and engineering literacy. Check out a new video on NAEP's transition to a digital platform. View a new infographic on the relationship between attendance and performance on NAEP Science. A new infographic explains the NAEP achievement levels and why they are important. Discover our one-pager that provides details and resources related to The Nation's Report Card. Explore the 2017 NAEP Reading Framework, the foundation for this assessment. Which rural states made the most progress on NAEP? Find out! Find out how rural students perform in NAEP compared to those in cities, towns, and suburbs. How much do rural and suburban fourth graders tend to read daily? This video excerpt sheds some light. The new NAEP 2018 Civics Framework is out. Read more about the foundation used for this year's assessment. This NAEP infographic shows a relationship between the experience level of math teachers and students' race/ethnicity. Watch this video to explain how NAEP's 2017 digital transition enabled score comparisons to past assessments. Former Supreme Court Justice Sandra Day O’Connor speaks on NAEP Civics. U.S. Sen Lamar Alexander discusses NAEP’s unique role in assessing U.S. history, civics and geography. Honoring Pi Day, check out some NAEP math questions. Learn more about 2017 NAEP Mathematics and Reading in this one-pager. Highlights Video from the International Assessment Panel. A report from the American Enterprise Institute uses NAEP and NCES data to paint an interesting portrait of rural education. Explore the new results from the 2016 PIRLS (The Progress In International Reading Literacy Study) and how U.S. fourth-graders compare to their peers in other countries. Check out our new video infographic on the Trial Urban District Assessment and its value to leaders nationwide. Watch the webcast and read a special publication of NCES' 150th anniversary celebration. Our members took flight literally: Read a summary of our activities at the Board's quarterly meeting in Montgomery, Ala.
A new report shows how state proficiency standards measure up when put on the NAEP scale. A new IES report looks at students' views of mathematics, reading, and science, using NAEP data. This infographic explores the relationship between Grade 8 NAEP Mathematics scores and absenteeism in TUDA. New research finds multilingual students have made major gains on NAEP since 2003. 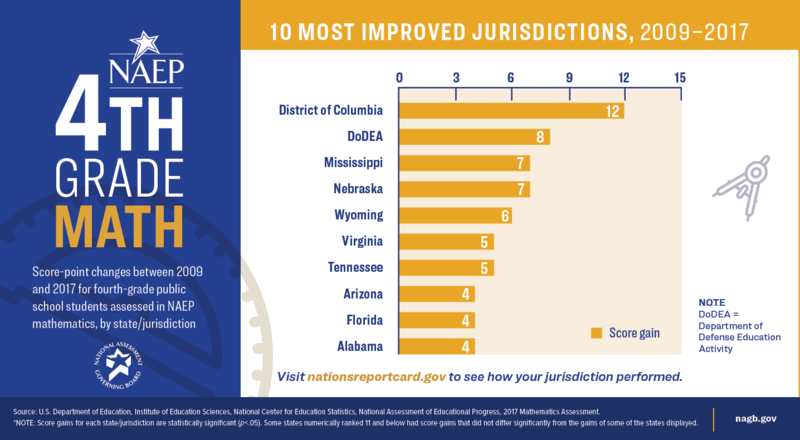 This infographic reveals the top 10 most improved jurisdictions on Grade 4 NAEP Mathematics. This infographic reveals the top 10 most improved jurisdictions on Grade 8 NAEP Mathematics. The 74 includes NAEP scores in its breakdown of nine key statistics behind major education stories of the past school year. Which Urban Districts Improved the Most?